Prêt-à-porter (ready-to-wear) corsets are primarily fitted based on waist and bust measurements. 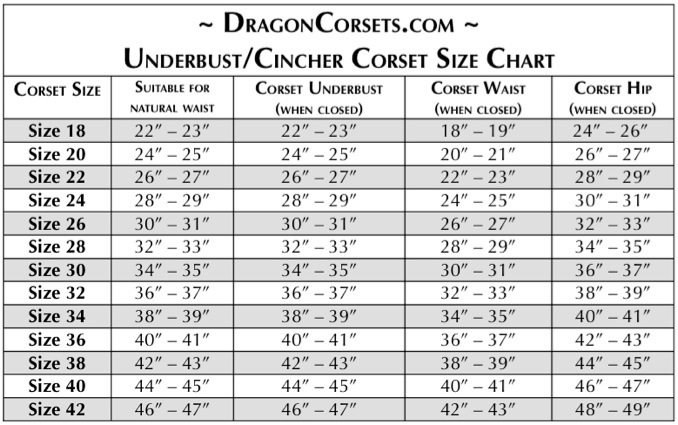 Corset sizes are based on the "closed waist" size of the corset; meaning the measurement of the waist of the corset when the back opening is laced tight until both edges are touching. Generally, it is a good idea allow approximately 2 to 3 inches of "gap" in the back lacing of a corset, depending on how tight one is used to lacing up one's corsets. This allows for adjustment of comfort level, as well as the occasional slight variations in weight gain or loss. The majority of our corsets have a 6 inch modesty panel flap in the back, allowing you plenty of leeway for coverage.